Hurricanes and Defiants were based here before the station switched to Beaufighters and night fighting. Mosquitos arrived before the end of the war after which Coleby Grange closed. It was reopened as a Thor missile base, finally closing in 1965. Travelling south on the A15 from RAF Waddington, the derelict watch office of Coleby Grange soon comes into view. The airfield is to the west of the A15, behind the Boundary Café, which itself stands on part of the former technical site. A fighter station, the grass-surface airfield opened in spring 1940 and has three runways, one of which necessitated closing a minor road to the south of the site. Originally one T1 hangar was provided but later eight blister hangars were erected. The communal and accommodation sites were dispersed in fields and woodland to the south east. Initially conceived as a relief landing ground (RLG) for Cranwell, its role soon changed to that of a fighter satellite airfield and in May 1940, a detachment of 253 Squadron Hurricanes from Kirton in Lindsey were based there. This was followed by a detachment of 264 Squadron, also from Kirton in Lindsey, who arrived with their Defiants in July 1940. Early 1941, Coleby Grange became a satellite for Royal Canadian Air Force Digby when 402 Squadron RCAF arrived. A change to night fighting occurred 26 July 1941, when 409 Squadron RCAF arrived from Digby. Although originally equipped with Defiants they soon converted to radar-equipped Beaufighters and remained at Coleby Grange until February 1943 when they moved to Acklington, Northumberland, though detachments still visited the airfield. Another Canadian unit, 410 Squadron, itself previously based at Acklington, swapped places with 409 Squadron but were equipped with the more potent Mosquito night fighter aircraft. In October 1943, 410 Squadron moved to West Malling, Kent after which Coleby Grange became a transit station, with many squadrons passing through. 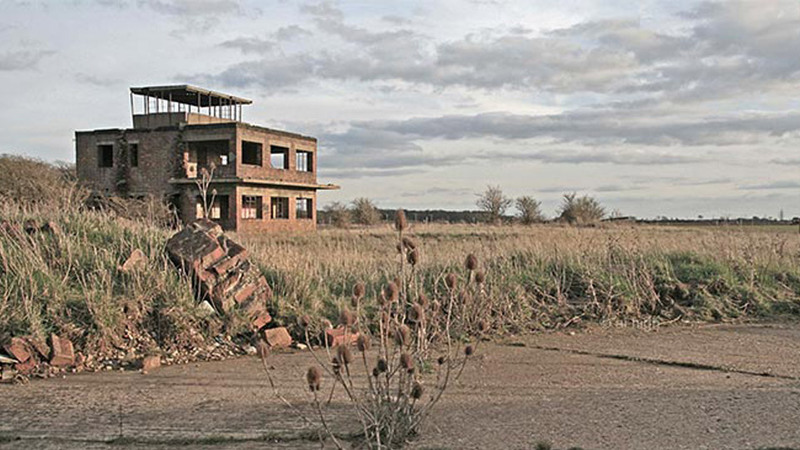 During 1944, the airfield was transferred to Training Command and was used once more as a relief landing ground for Cranfield until June 1946. Today, little remains except the derelict watch office, the T1 hangar, parts of the perimeter track and a few scattered remains of the buildings. The concrete blocks visible in the middle of the airfield are remnants from the Cold War when the airfield saw brief use as a missile base.